Shantytown Heritage Park is set on 500 acres of native rainforest. The town and surrounding buildings consists of 30 shops and buildings to explore. 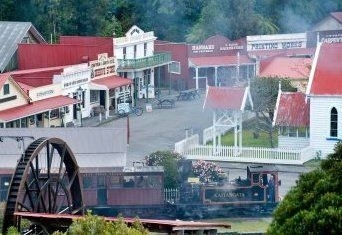 Shantytown is located on Rutherglen Road, Paroa (suburb), just 10Km south of Greymouth, on the West Coast of the South Island. First Steam Train leaves the Shantytown Railway station at 9:45 am last train leaves at 4pm. Extra train trips may operate.